I have always been a fan of almonds – it was one of the crops that my grandparents grew, and we always had fresh almonds every year!! 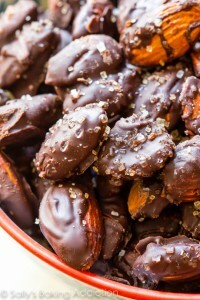 Now this recipe has two more of my favorites – chocolate & sea salt. What a yummy combination!! These would be great to give as gifts! Click on photo to be taken to the recipe.